Checkered white butterfly, photographed at Oleta River State Park, North Miami, Miami-Dade County, in May 2013. You might not want to see this butterfly in your backyard garden, at least not if you're growing plants that are members of the mustard family, Brassicaceae, which includes backyard garden favorites such as cabbage, brussel sprouts, broccoli and cauliflower. But if you do spot a few, don't panic. 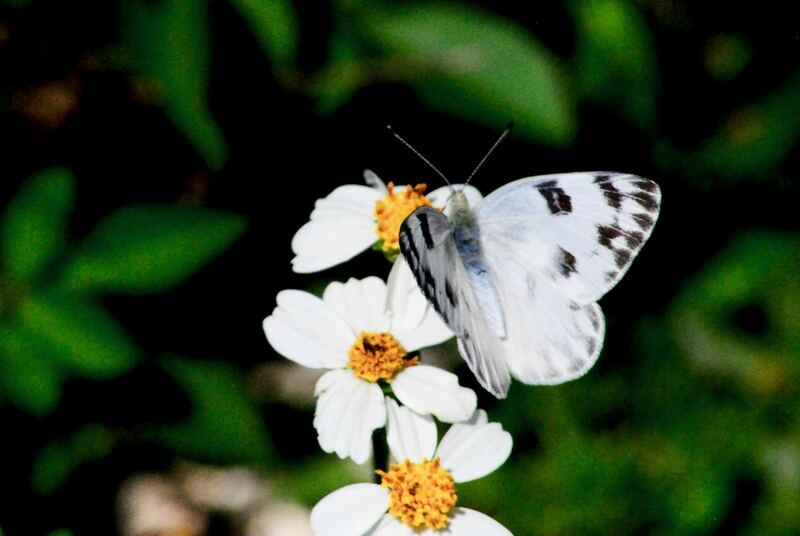 Because of their appetite for veggies that most kids won't touch, the checkered white butterfly, Pontia protodice, is one of the few butterflies we've encountered to have two accepted common names, depending on the stage of life. The Entomological Society of America recognizes southern cabbageworm as the official name of the larvae, or caterpillars, while the North American Butterfly Association gives its thumbs up to checkered white for the adults. Whatever you call them, the offspring of the checkered white are more nuisance than agricultural scourage. They will eat the outer leaves of the plants, but will leave the heads alone, unlike the larvae of a similar looking pest, the cabbage white butterfly, Pieris rapae, which will bore into the heads and essentially destroy them. However, cabbage whites don't venture south of Central Florida. Other than that minor character flaw, checkered whites are pretty cool as butterflies go. They are medium sized, with a wingspan that can approach two inches; their range includes the southern tier of the U.S., including Florida, but they can be found in most of the lower 48, with the exceptions of the Northwest and New England. They will even venture into southern Canada. Southward, they can be found throughout Mexico and Central America. 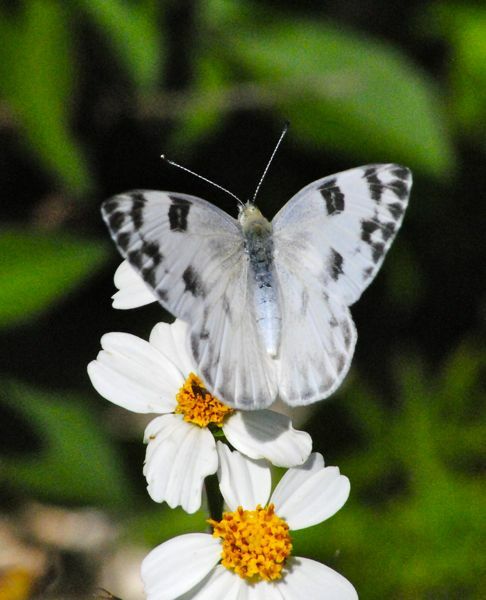 Although their population globally seems secure, the checkered white has become rare in places along the East Coast, particularly from New England to the Carolinas. Scientists speculate that biological methods used to control white checkereds are taking a greater than expected toll on the species. 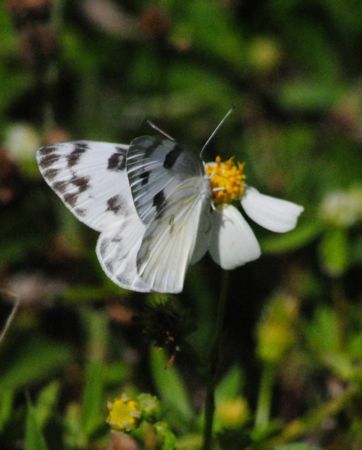 In Florida, however, checkered whites, remain fairly common. One other note: checkered whites are known to come and go according to the weather, particularly rainfall. They might disappear altogether from a region in times of drought, reappearing several years later in large numbers when rain is plentiful. 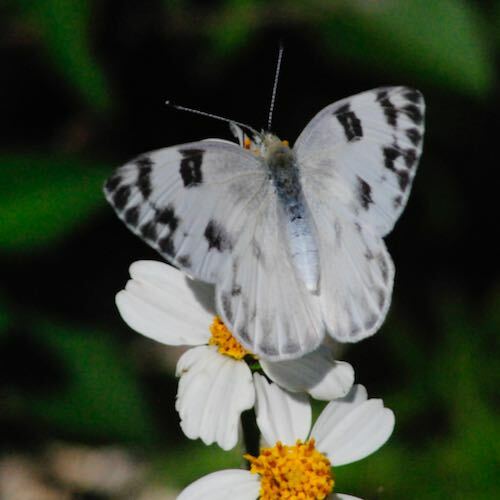 Checkered whites get their name from the series of black and white "checkered" markings on the outer portions of their wings. They are dimorphic, meaning males and females have different looks. Males tend to be more white and less distinctively marked; females have more heavily marked, but markings tend to be brownish. Adults born in the spring and fall are more heavily marked than those born in summer, but tend to be smaller. Butterflies in northern portions of their range can produce three generations in a year, four farther south. Females lay single barrel-shaped eggs on the stems or fruit of the host plants. The eggs are yellow but turn orange as they mature. The caterpillars are striped yellow and gray, with numerous small black dots. Adult checkered whites aren't picky eaters — they'll nectar on at least 50 different plants, including Virginia pepperweed and Spanish needles, as shown in these photos. Favorite habits include disturbed sites such as roadsides, where these plants tend to grow. It is a member of the Pieridae family of butterflis.